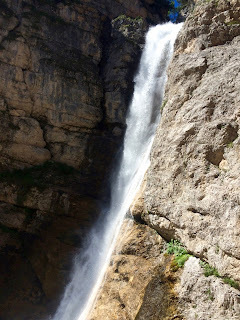 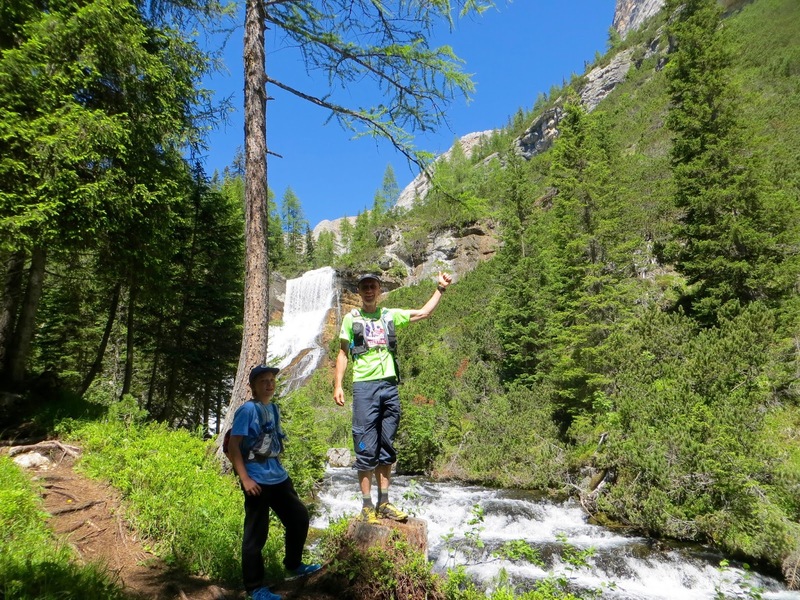 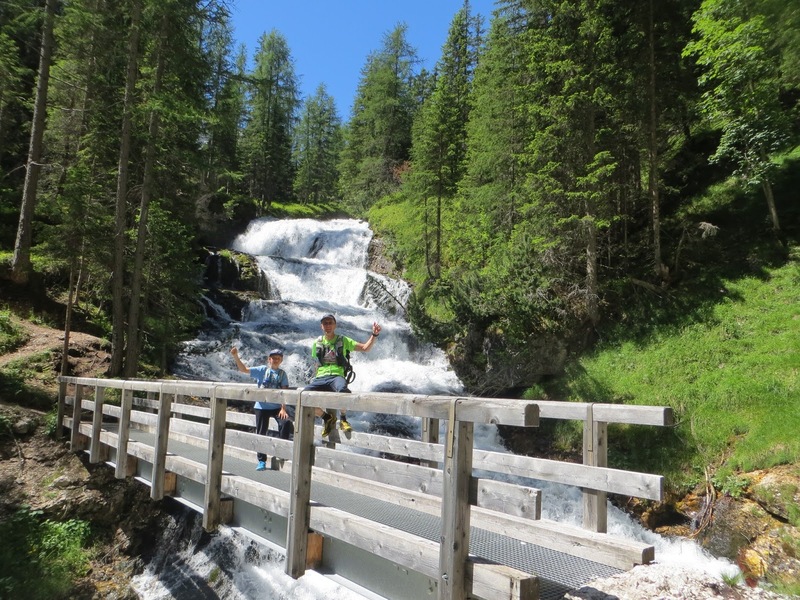 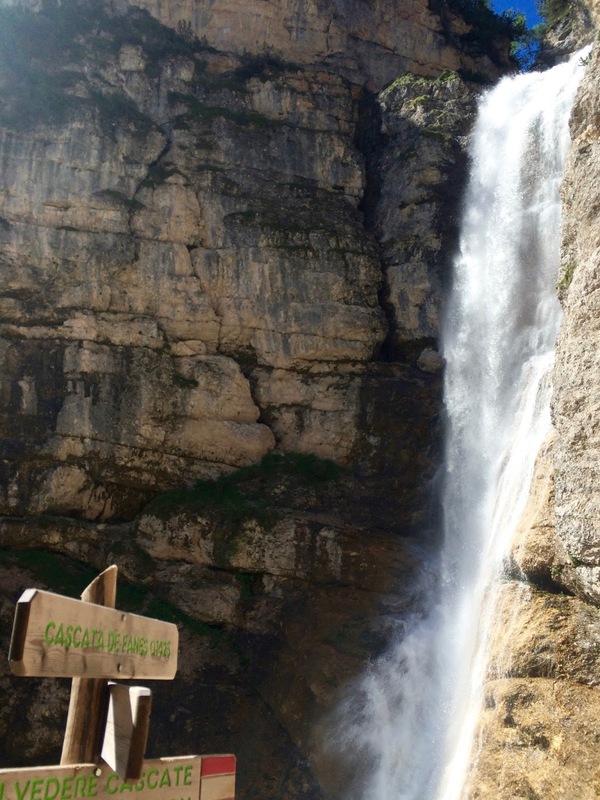 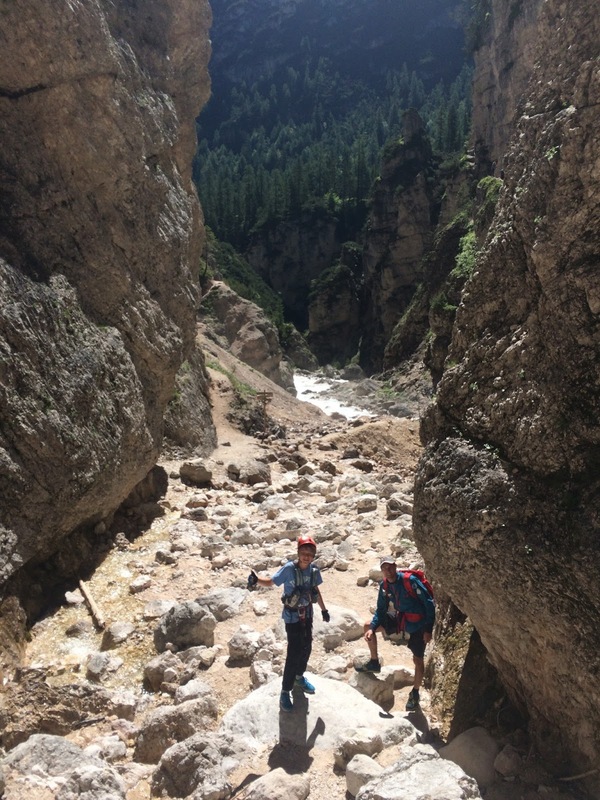 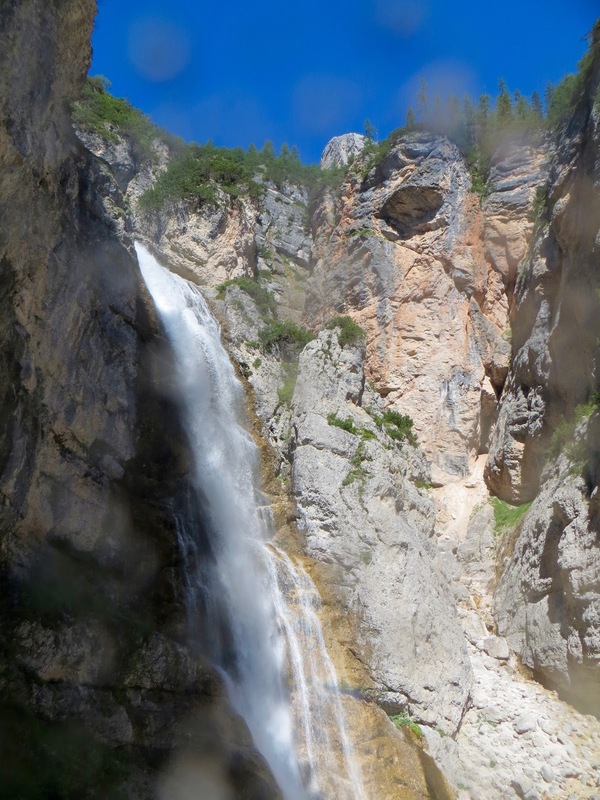 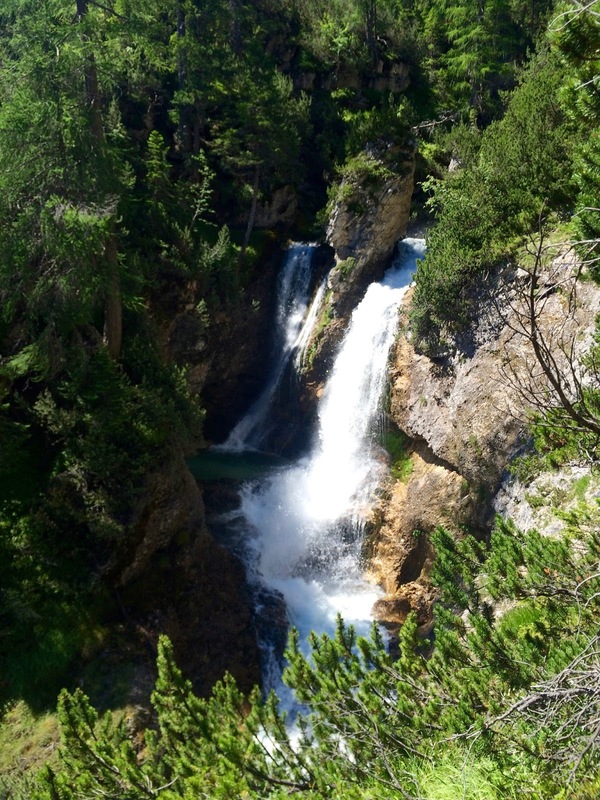 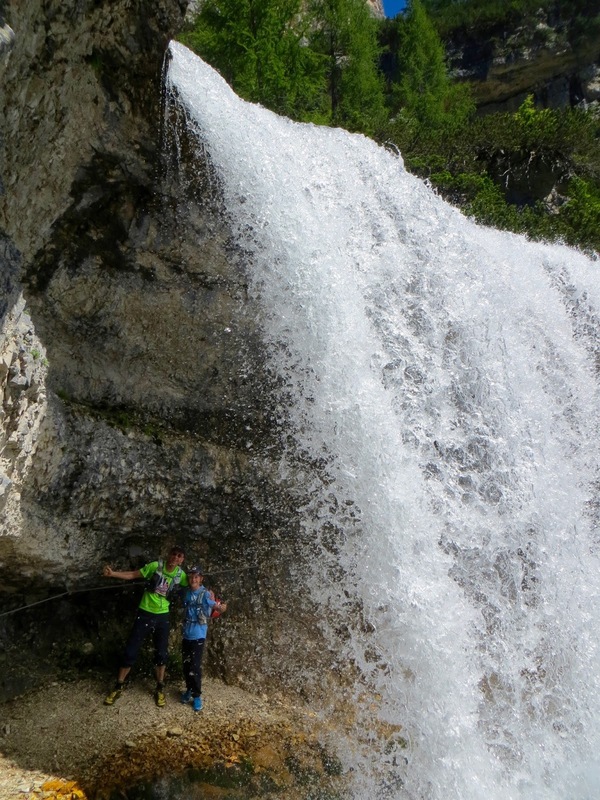 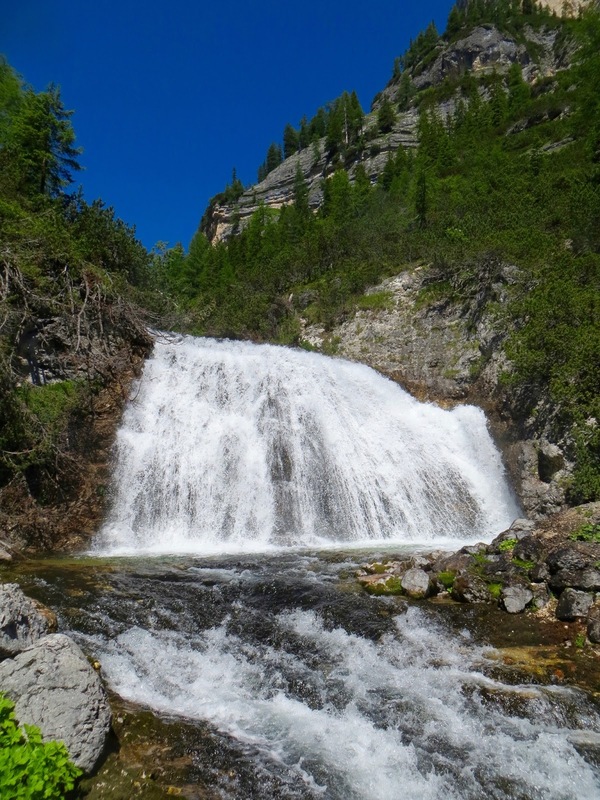 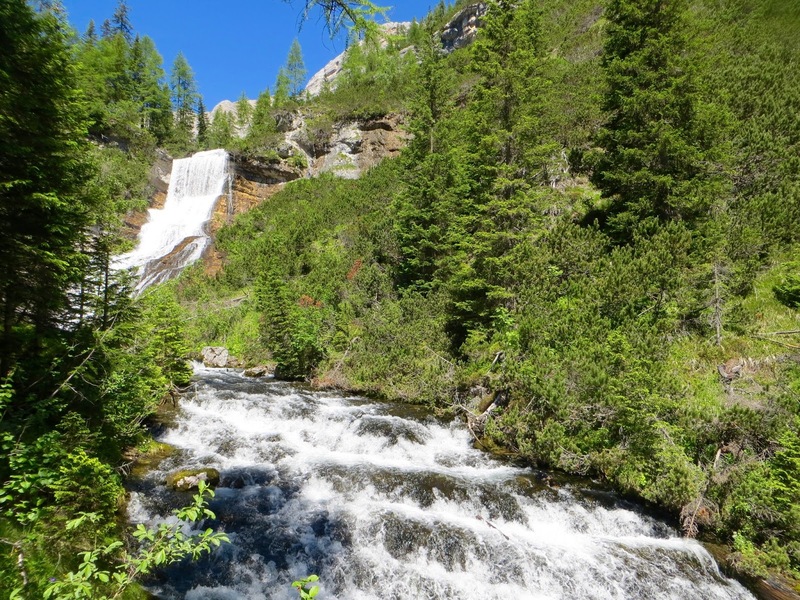 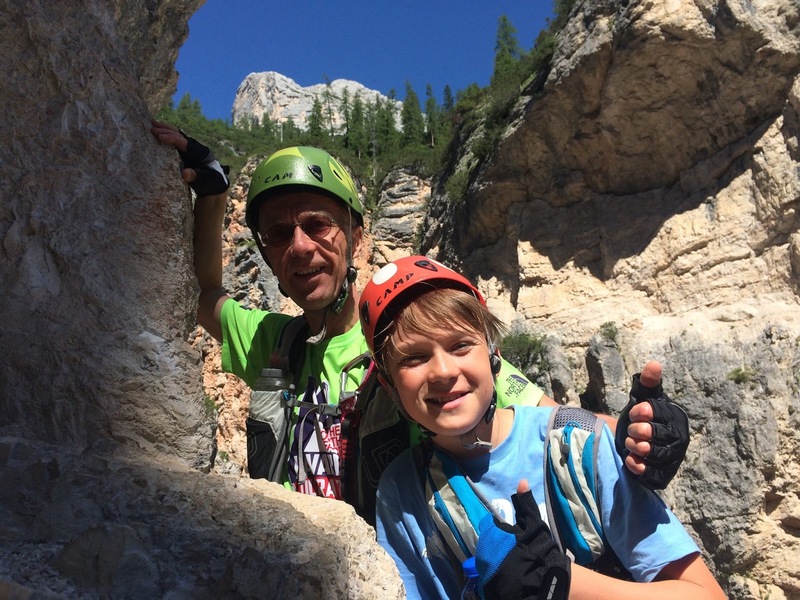 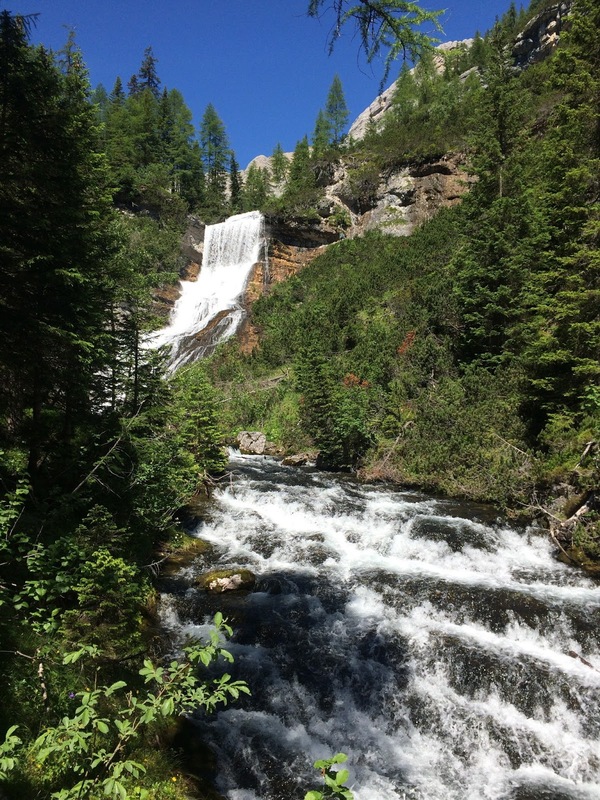 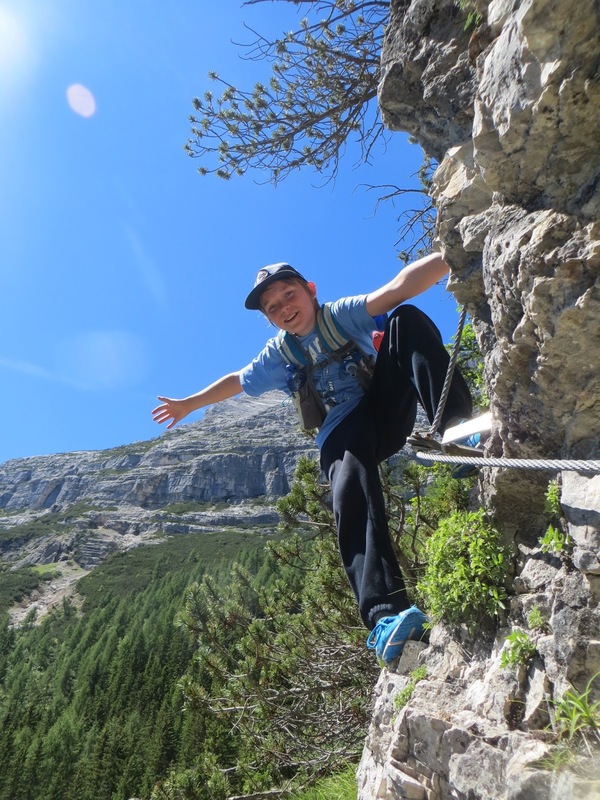 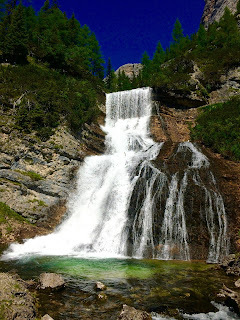 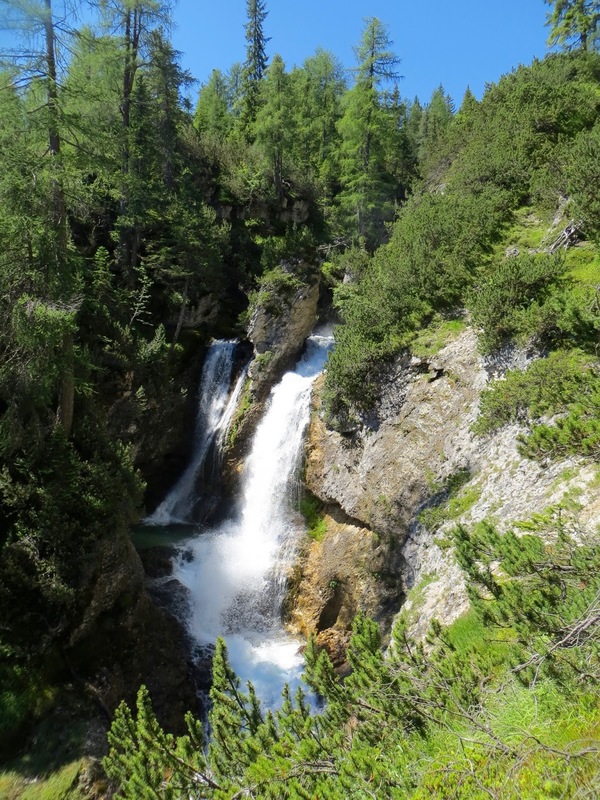 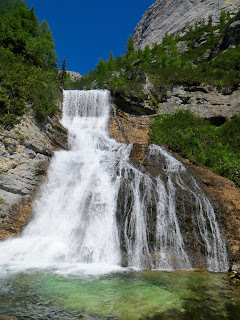 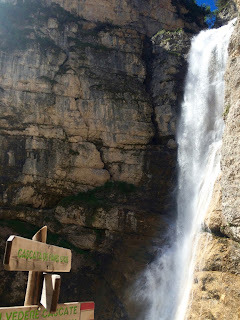 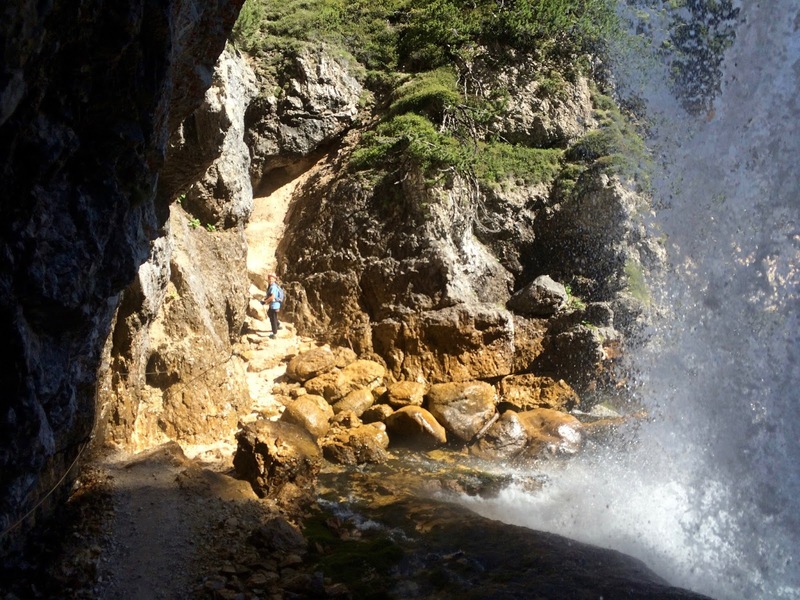 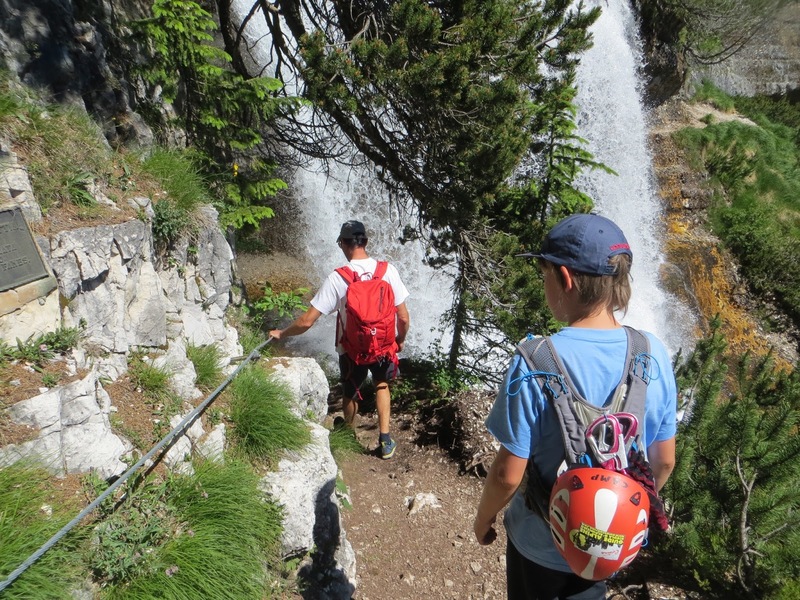 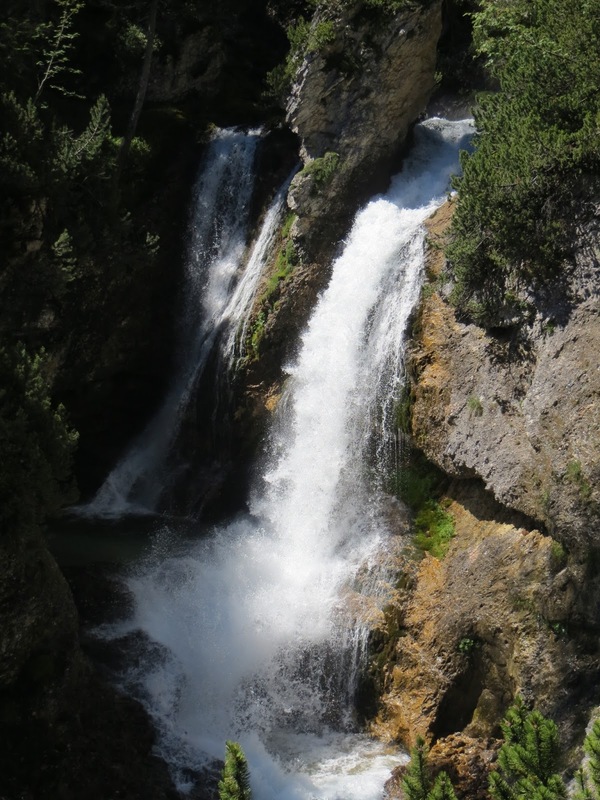 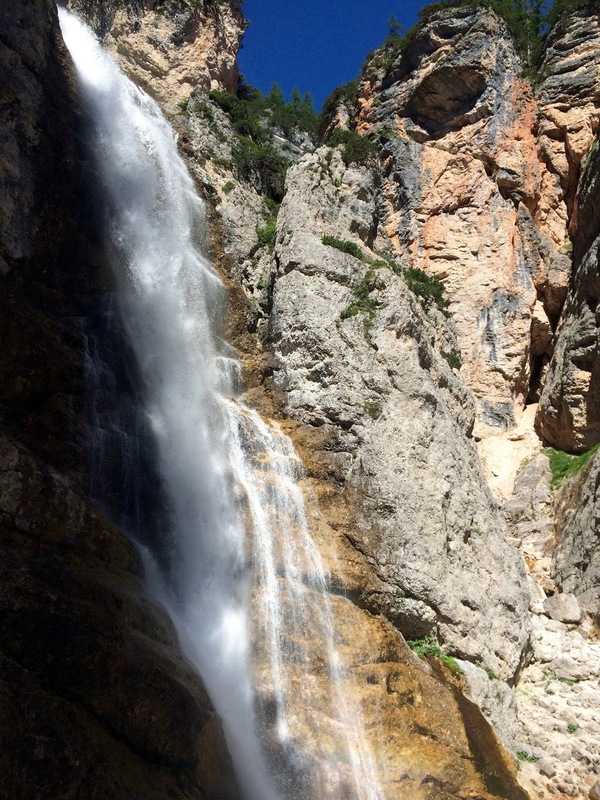 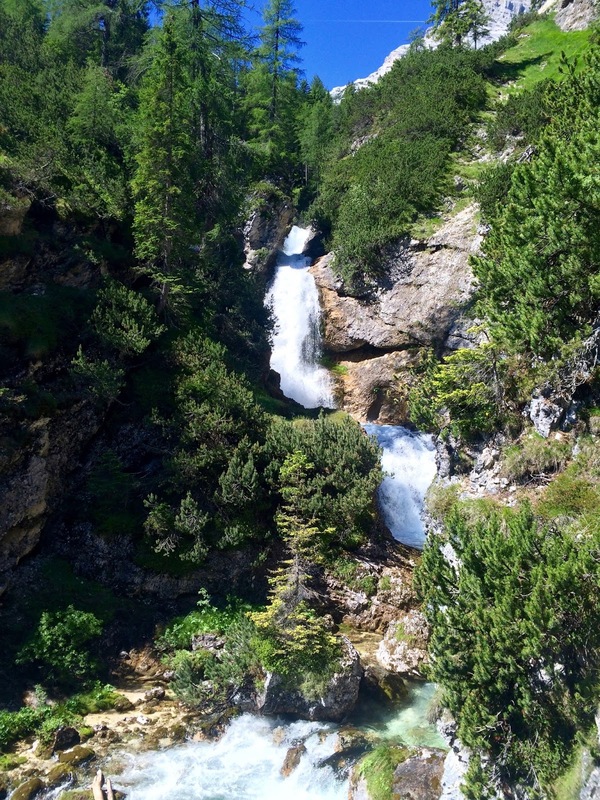 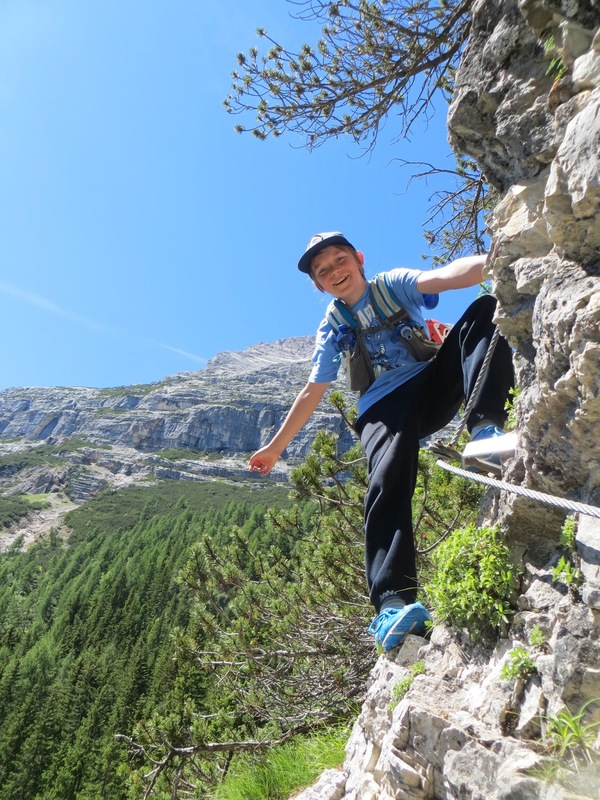 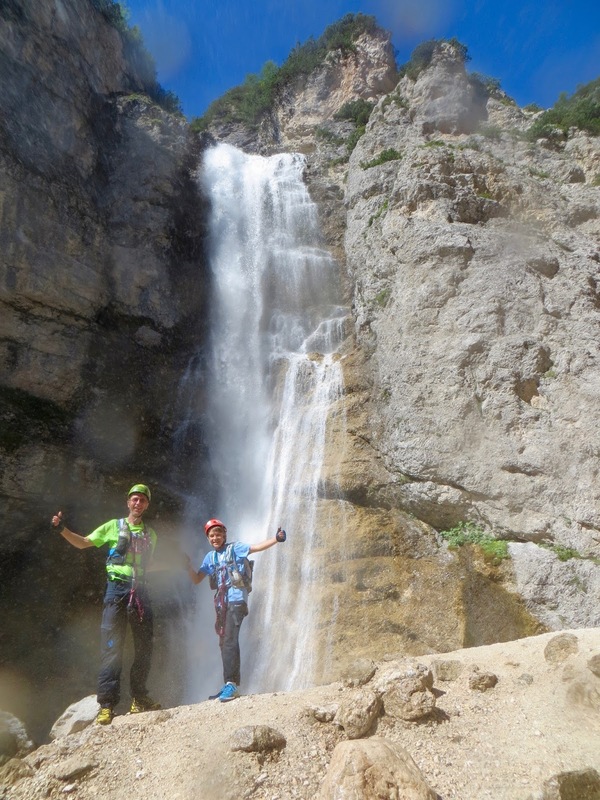 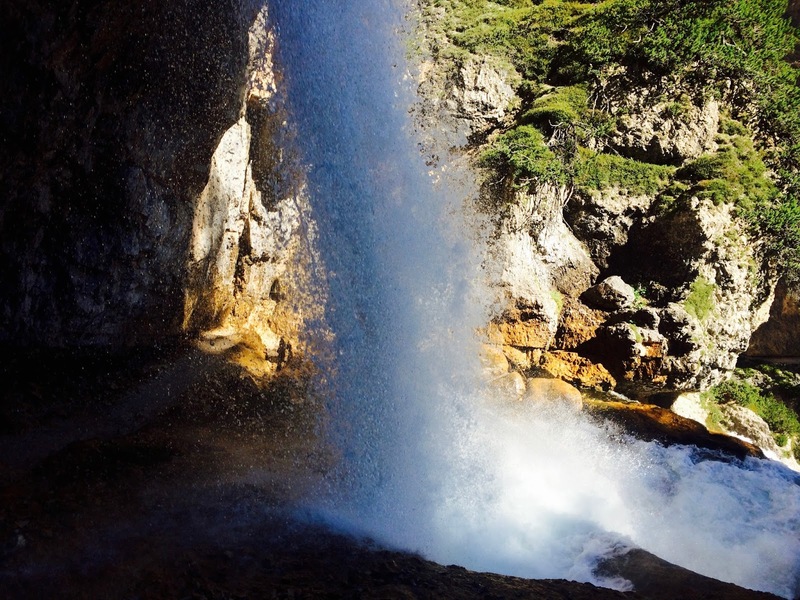 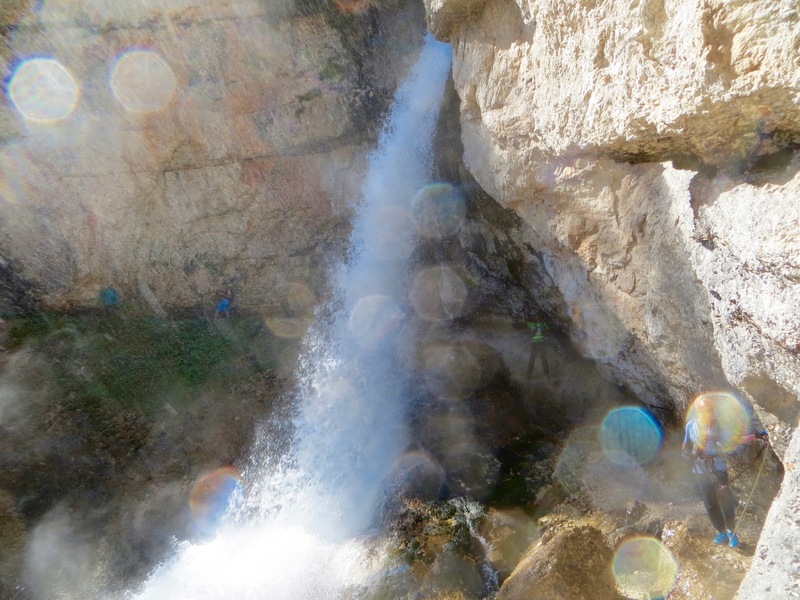 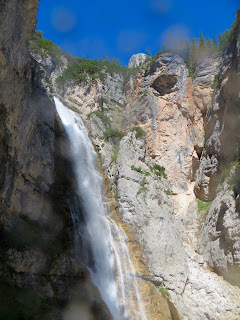 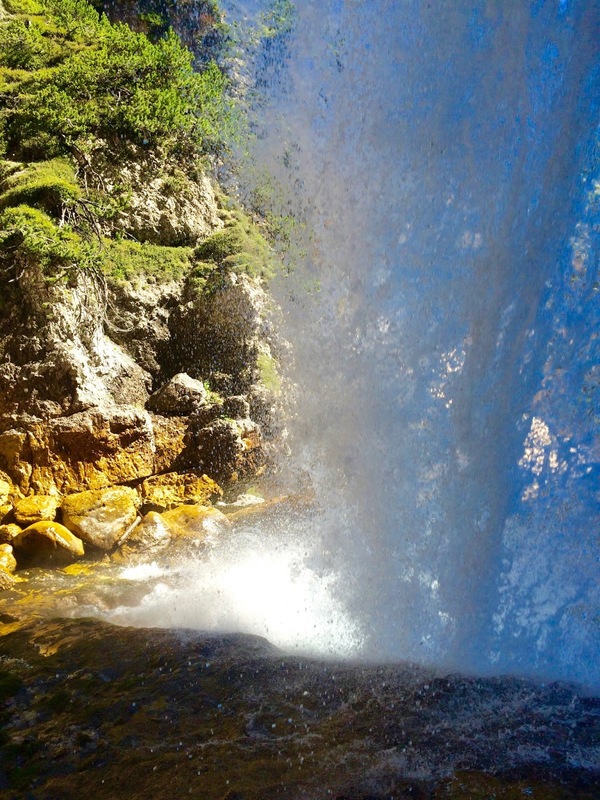 On the 4th day of our Cortina Epic Week 2016 we chose a slightly different destination: Cascate di Fanes. 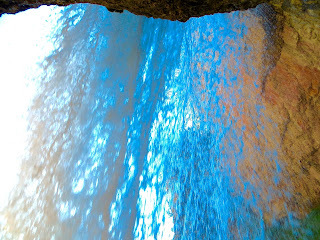 The word was these waterfalls are simply awesome. 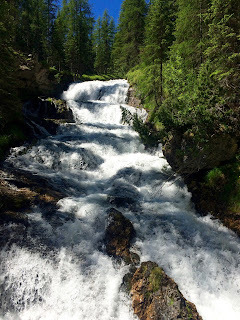 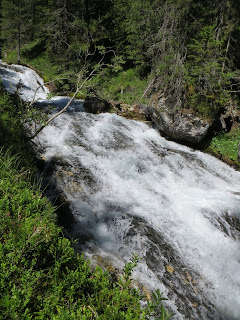 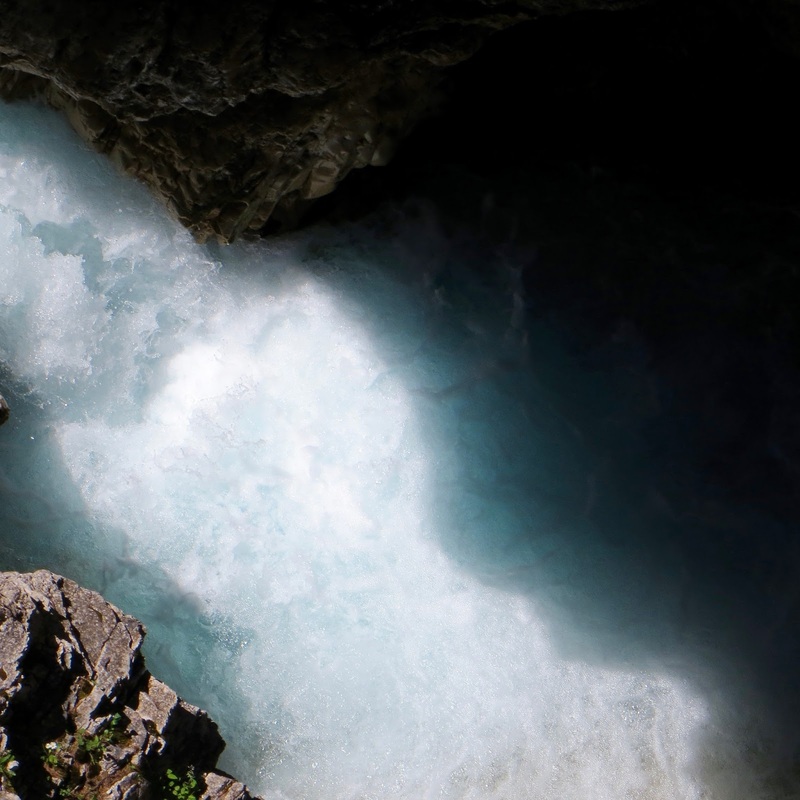 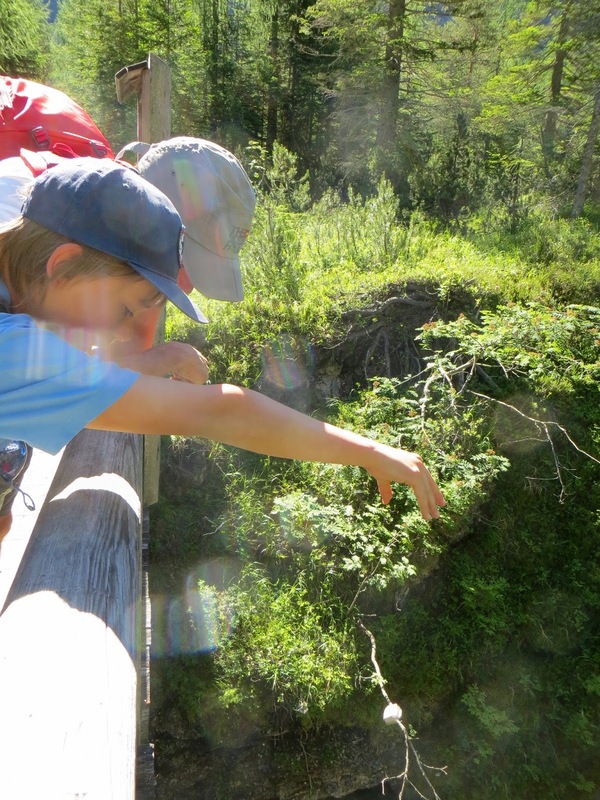 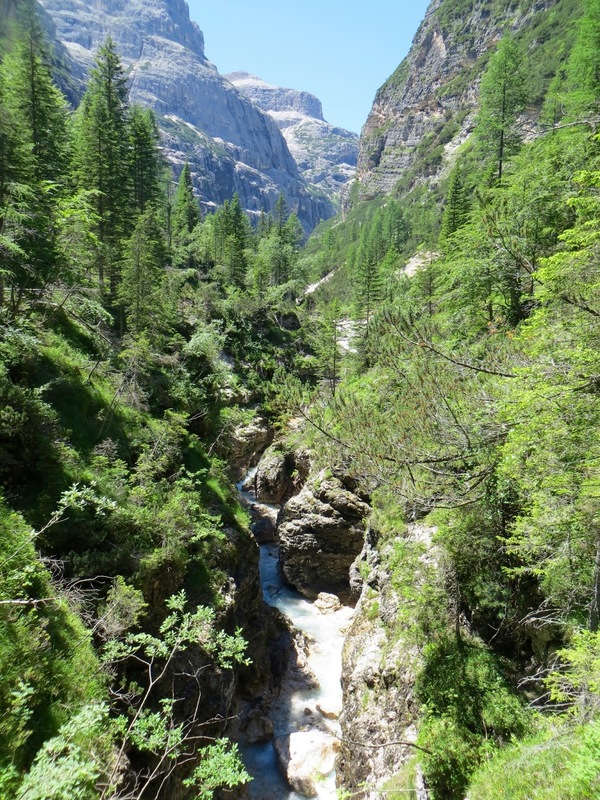 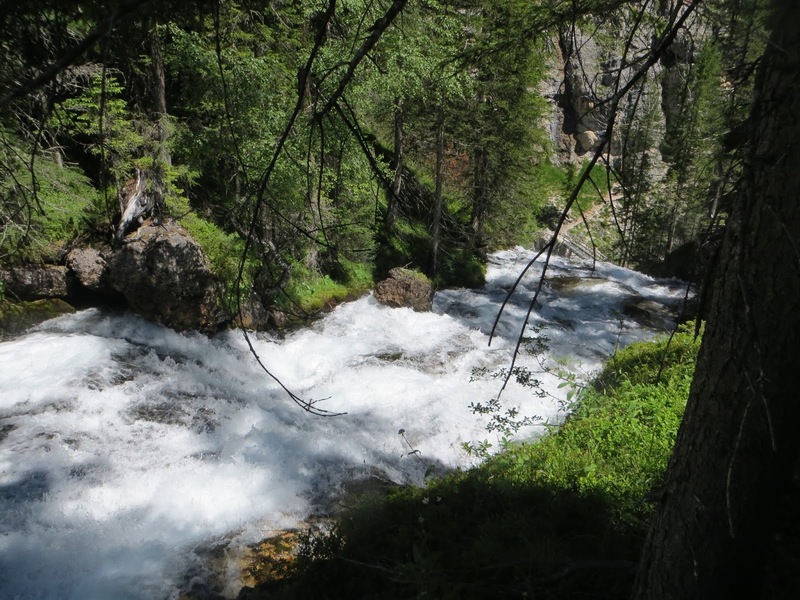 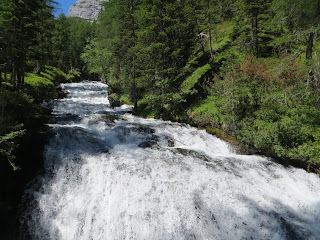 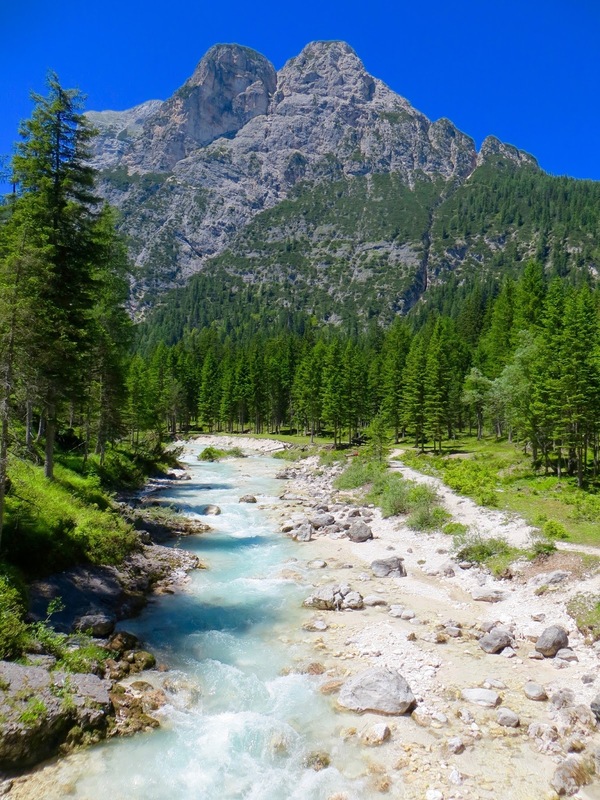 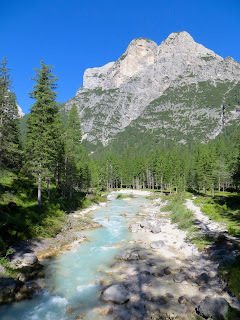 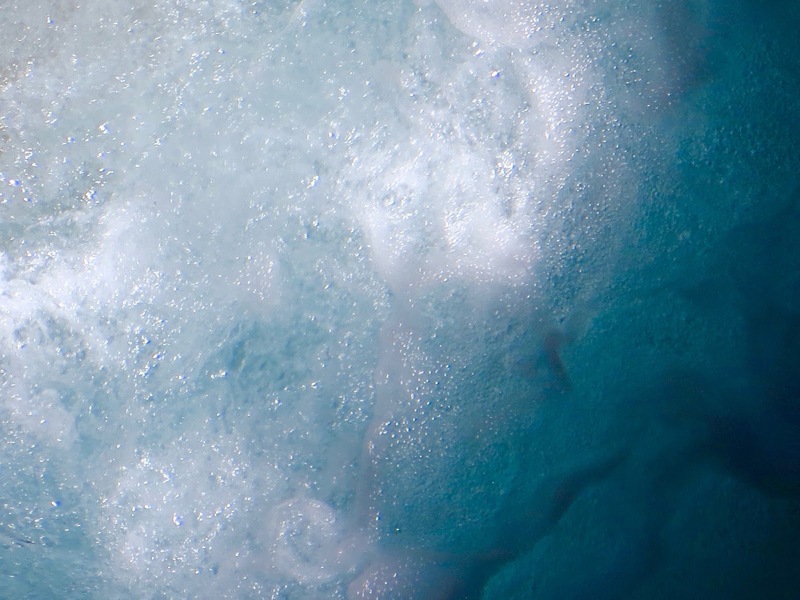 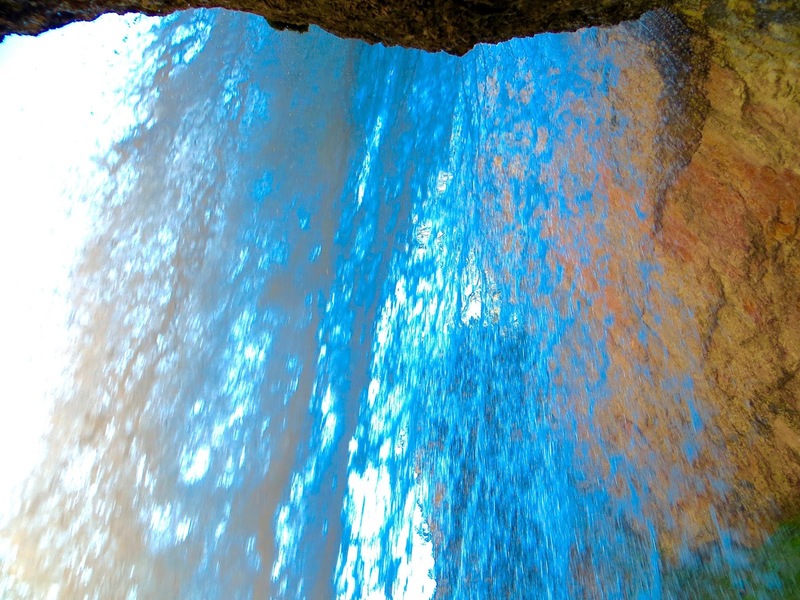 Now after the constant daily rain in Dolomites for the whole spring and early summer, the rivers were full of water. In fact this was the first sunny week in Cortina this year. 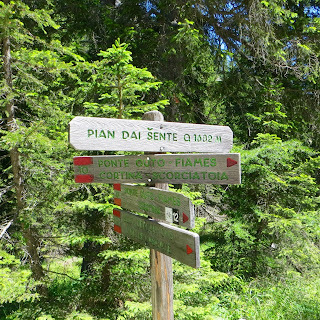 So let's go! 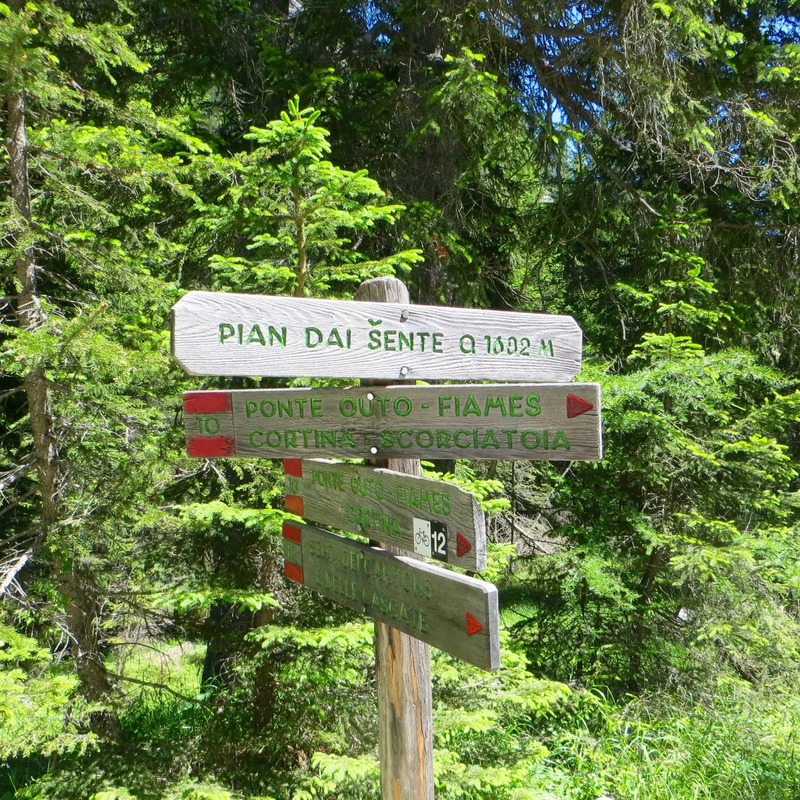 Our guide Paolo drove us to Pian de Loa at 1349m. 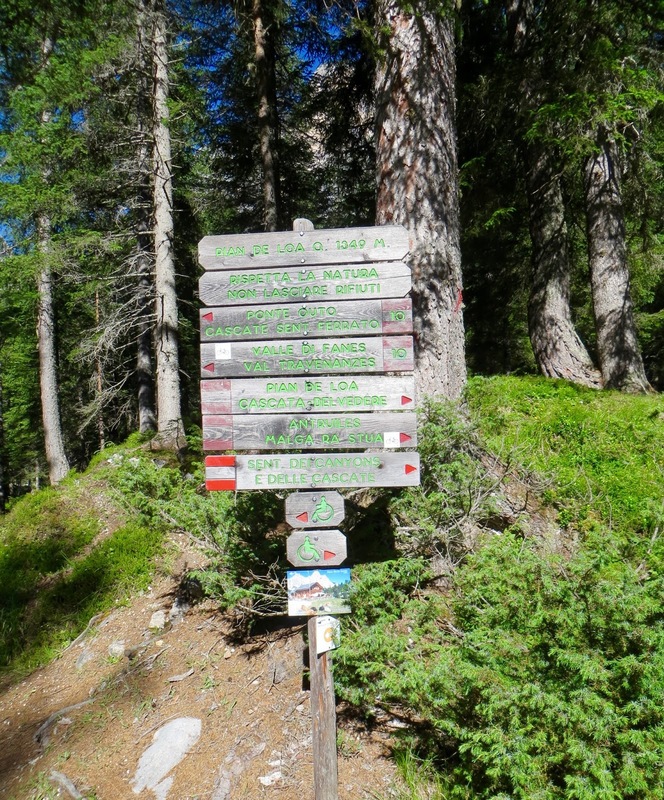 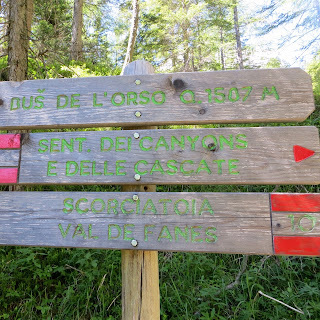 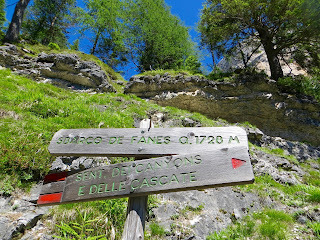 We hiked a few kilometers to the entrance of Valle di Fanes. 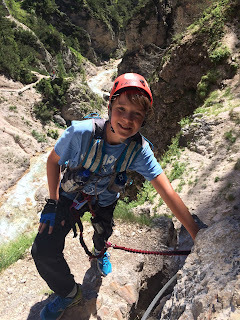 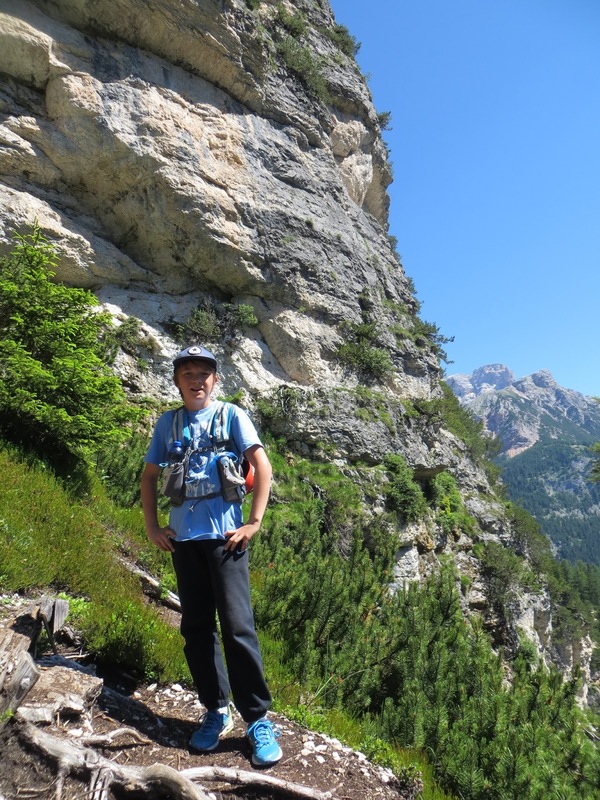 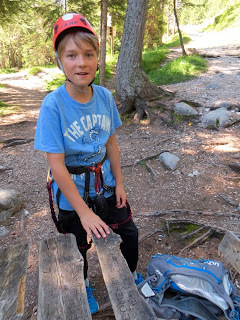 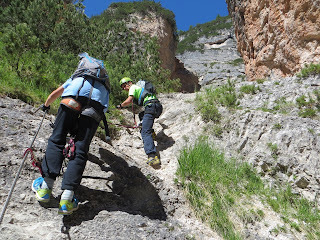 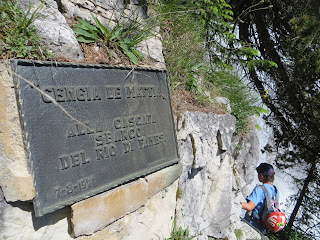 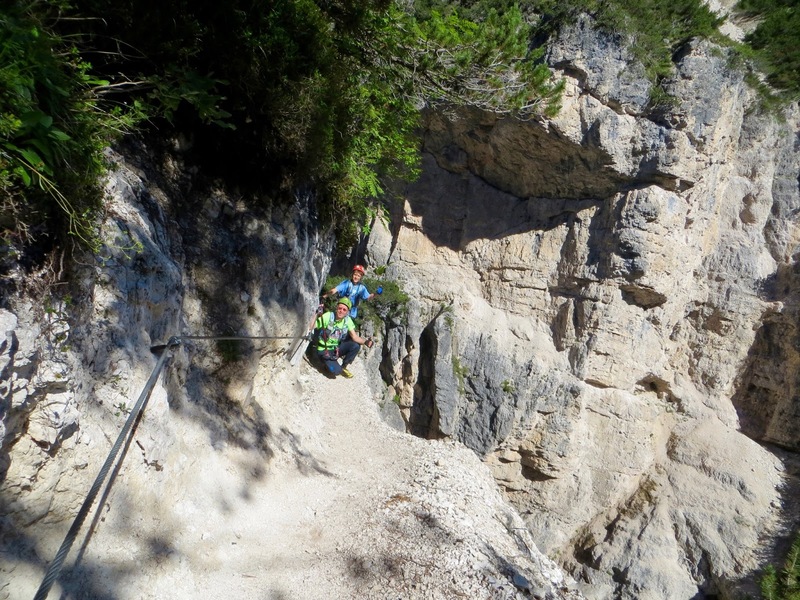 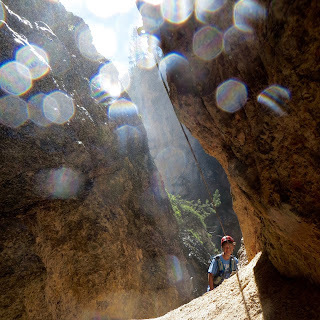 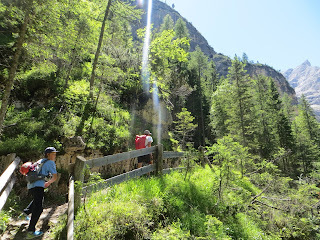 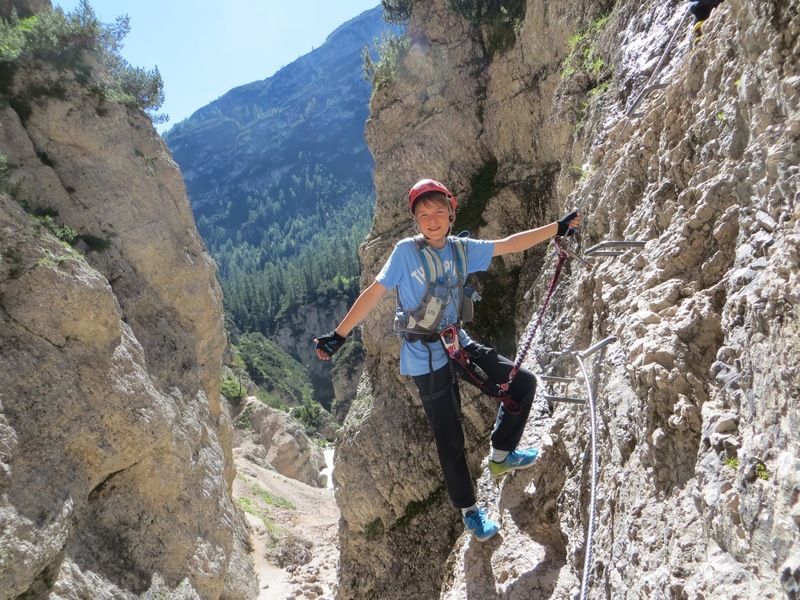 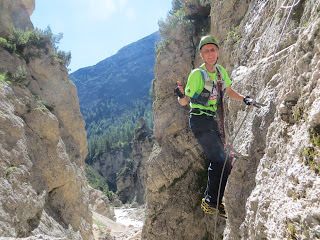 We put on our Via Ferrata gear and followed Sentiero dei Canyons e delle Cascate trail on the North side of River Fanes. 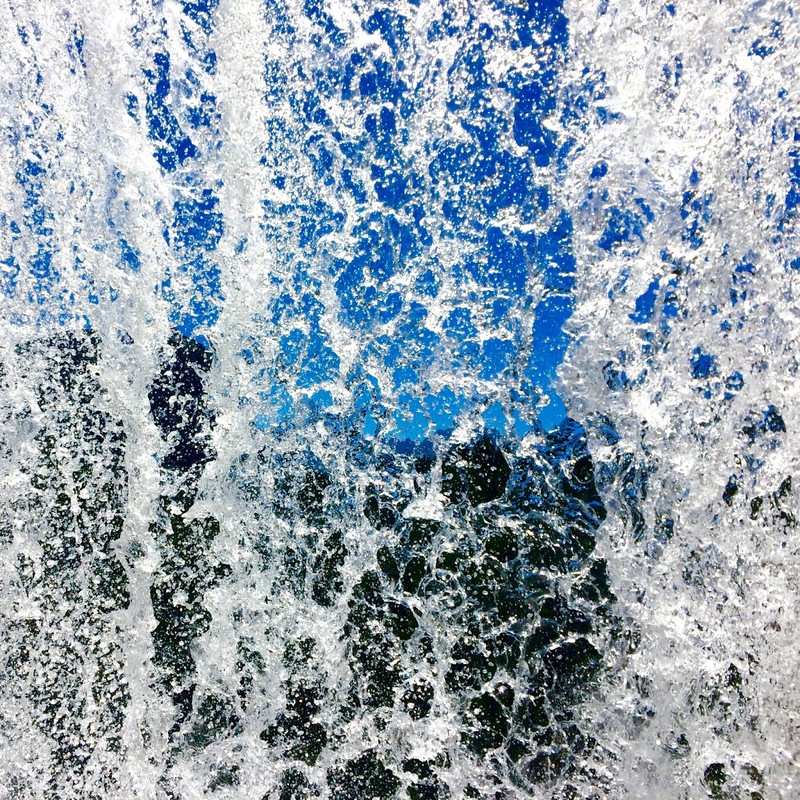 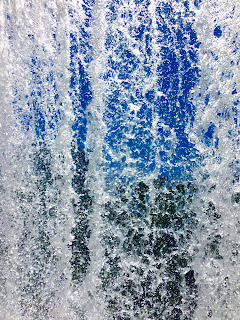 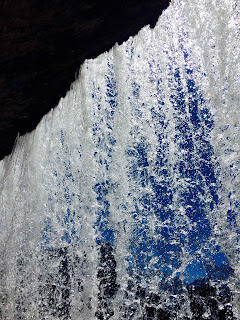 Our expectations were high, but so were the waterfalls. 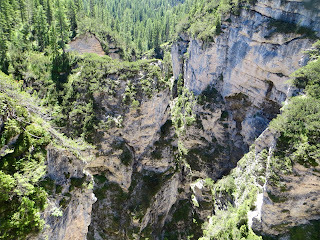 The highest were about 100 meters. 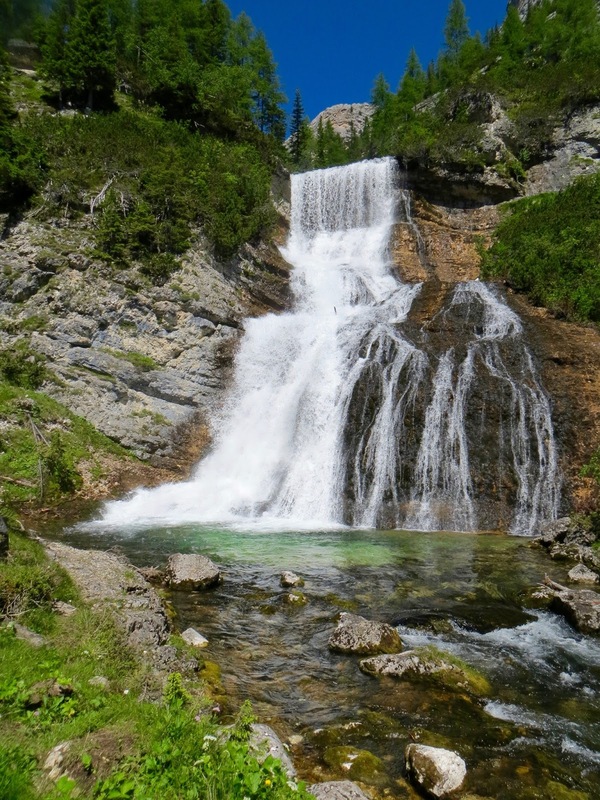 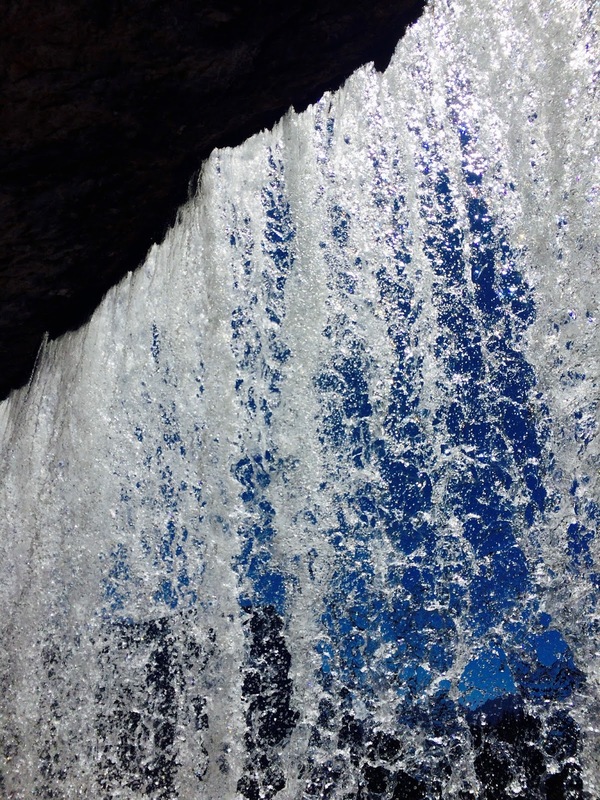 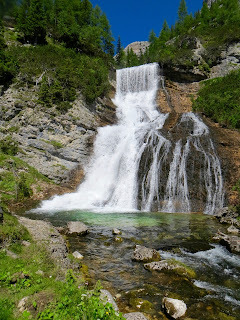 These were some of the largest waterfalls in the Dolomites. 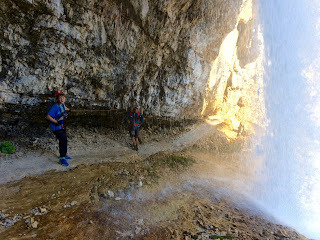 We were almost literally blown away as we went along the wet misty route. We got wet but it was ok, as it was gorgeous sunny day. It was very pleasant to be in the valley that day. 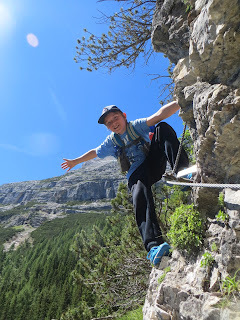 We hiked back the Val de Travenanzes on the South side of the river, crossing Ponte Outo bridge. 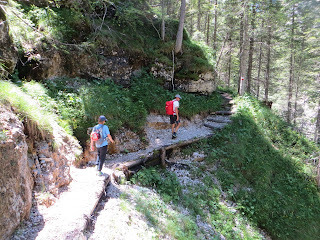 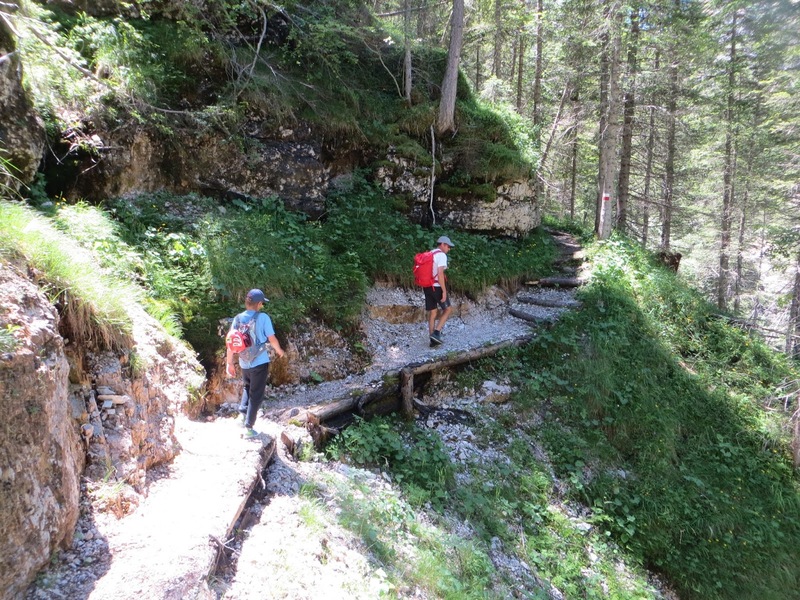 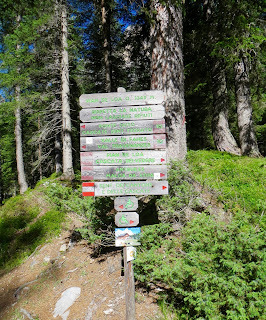 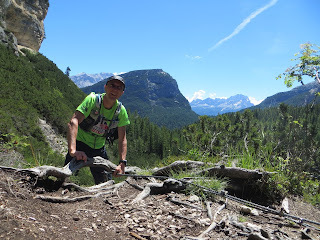 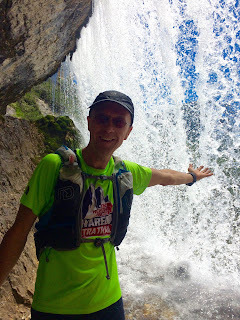 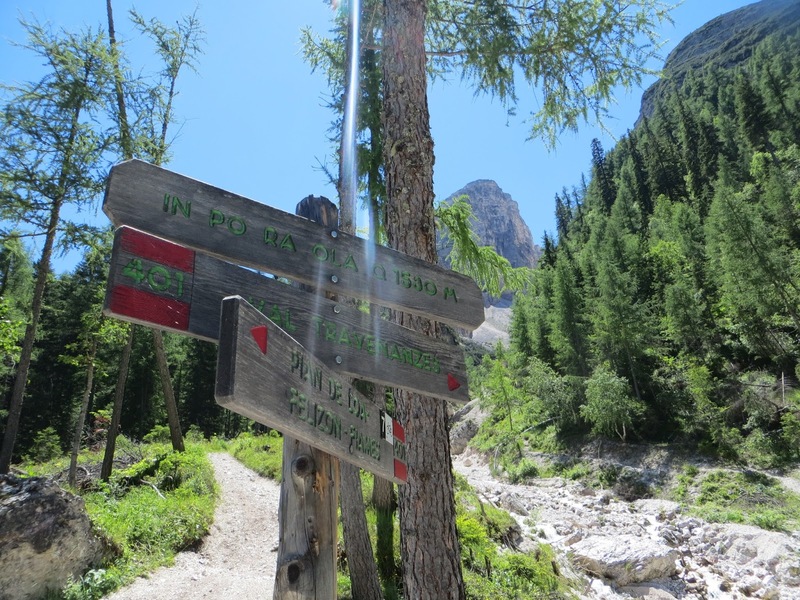 This was the same trail we ran in Lavaredo Ultra Trail, only in reverse direction. 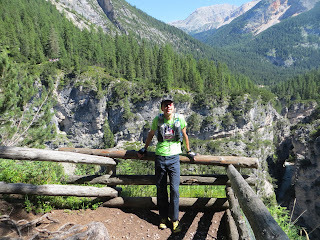 By the time we reached the car we felt tired but happy. 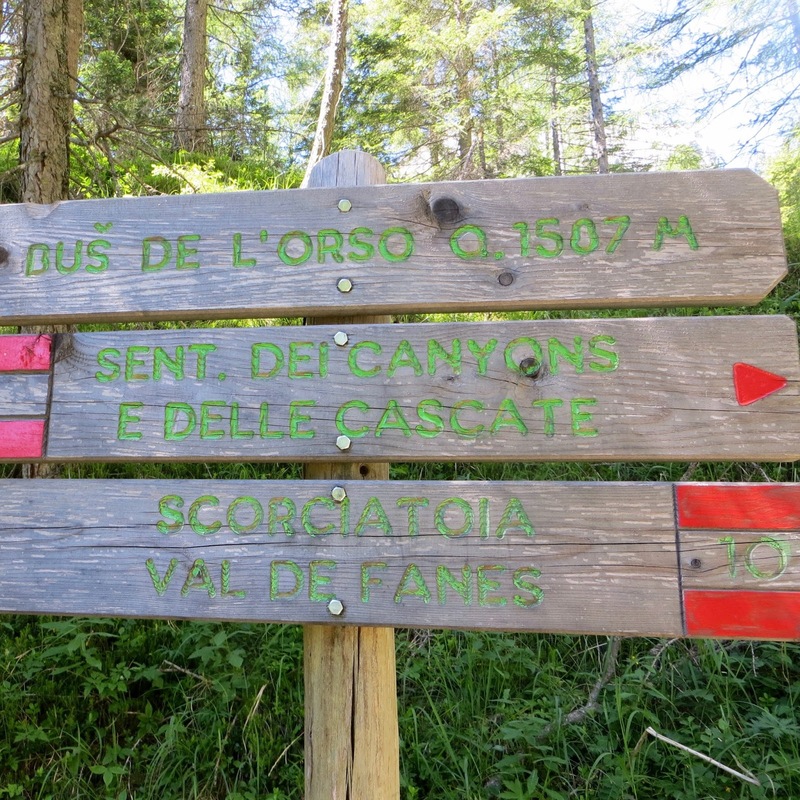 My watch said it was 14km with 800m climbing. Absolutely fantastic and spectacular trip! 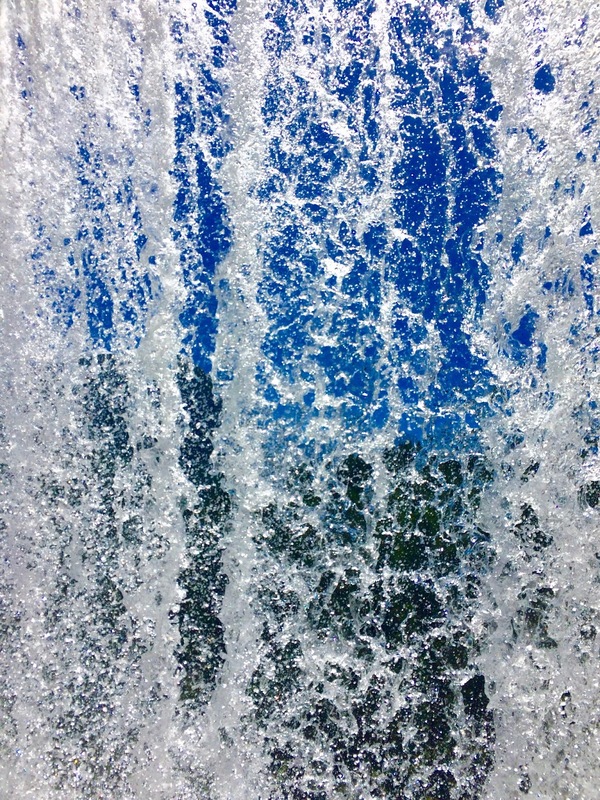 Definitely the highlight of the week. There are a few exposed and difficult points on slippery (and possibly falling) rocks, so proper Via Ferrata and rain gear is essential for safety. Having said that, we experienced no difficulties as the weather was awesome. 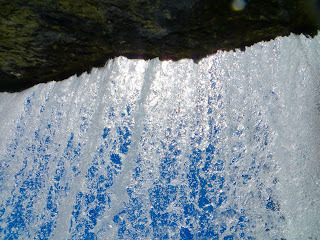 Again, here's a ton of photos. 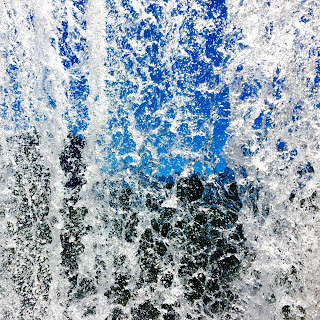 The real thing looks even better, of course. 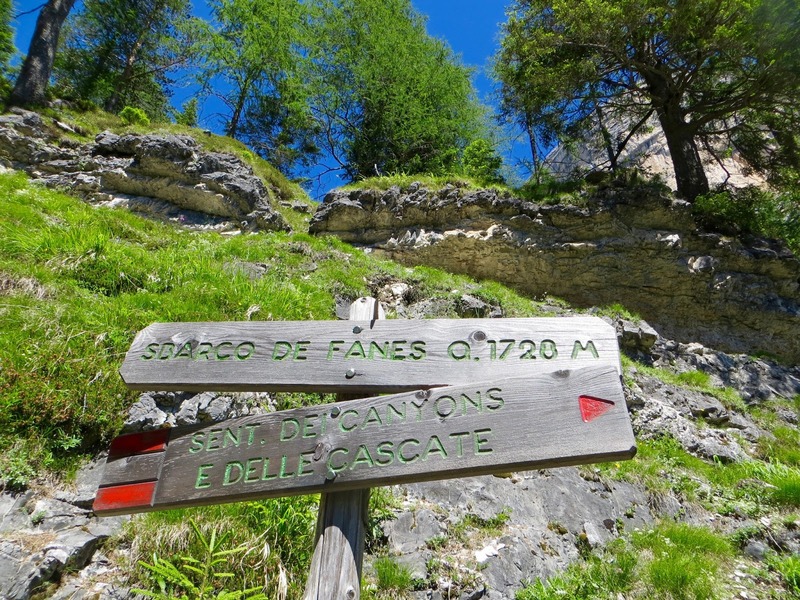 Don't hesitate to visit Fanes Valley if you are visiting this part of the Dolomites in early summer.